Up-zoned for development up to 200 feet in height, assuming the adoption of San Francisco’s Central SoMa Plan is upheld, detailed plans for redeveloping the nearly one acre parcel at 490 Brannan Street, at the corner of Fourth and upon which a Wells Fargo, Starbucks and 116-space parking lot currently sit, have been drafted and submitted to Planning for their preliminary thoughts on the project and approach as proposed. And as designed by Pfau Long Architecture for Strada Investment Group, which holds an option to purchase the site, the development as envisioned would only rise to a height of 160 feet but still yield nearly 340,000 square feet of office space; 17,000 square feet of Production, Distribution and Repair (PDR) space on the ground floor; 3,800 square feet of retail fronting Fourth Street; a basement garage for 49 cars and 272 bikes; and 6,500 square feet of required public open space. 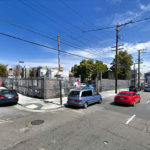 Our site is one of eight properties singled out as “Key Development Sites” in the Plan because of its high development potential and several important adjacencies, including a new MUNI station on 4th Street, and a planned bike and pedestrian thoroughfare along Brannan Street. 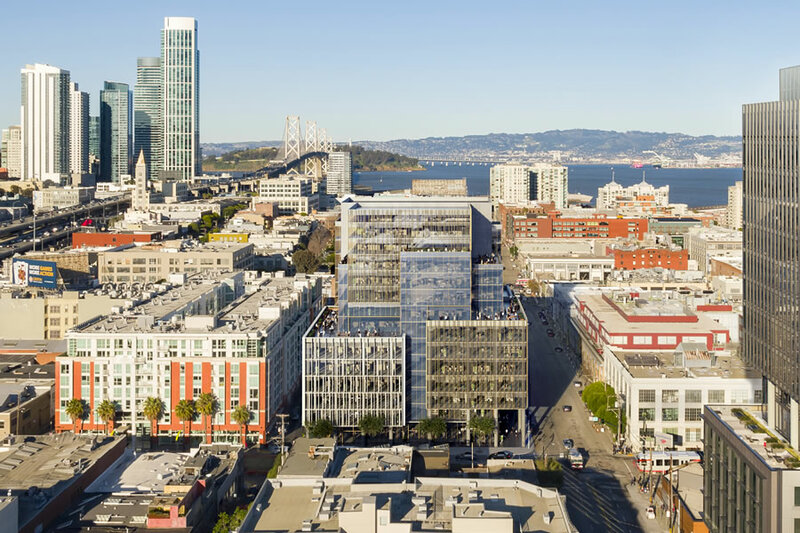 The design of 490 Brannan therefore has an important responsibility to the public realm and Plan’s vision. The project also sits south of Freelon alley, across from “The Palms”, one of the few large-scale housing developments in the area, so the design should take reasonable measures to mitigate the impact on the residents’ access to light and air. Mitigating scale and maintaining access to light and air at the street is an important aspect of the Plan. It defines two distinct methodologies for controlling bulk in new developments: The “Skyplane” method for buildings below 160 feet, which is a formula for measuring the “apparent” mass as perceived from street level, and “Tower” criteria for buildings above 160 feet, which defines a narrow tower atop a low podium. Our site has a 200 feet height limit, and therefore qualifies as a Tower, but because it falls near the threshold between these control approaches, we studied both, to compare the development capacity, design potential, and the impact at the street level, keeping the spirit of the Plan in mind. It was determined that by voluntarily limiting height to 160 feet to take advantage of the Skyplane method, the design potential was greater, the floorplates more marketable, and the massing was both more interesting from afar, and less imposing on the street, particularly toward the residences across Freelon. A Skyplane analysis was performed on the Freelon façade of a permissible 200-foot tower and compared to a 160-foot Skyplane scheme, the apparent mass from Freelon was measurably less in the 160-foot scheme. 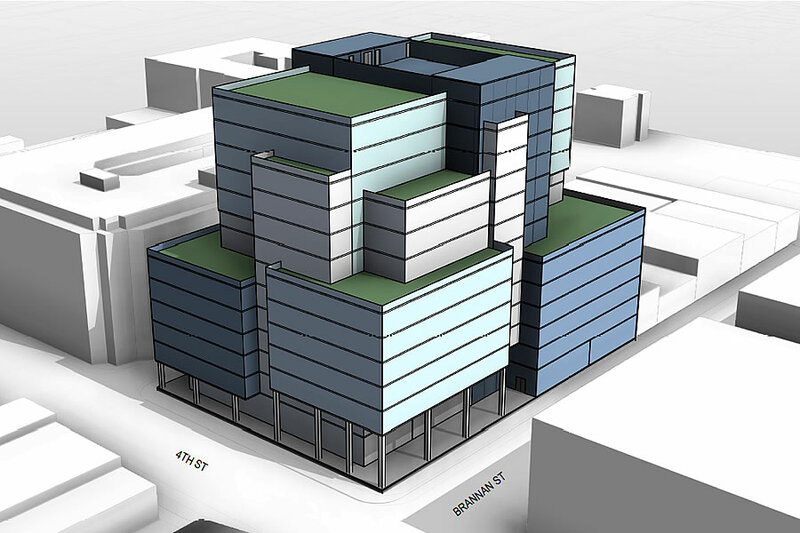 As recommended by the Key Site Guidelines, the 160 foot height scheme is proposed, with Skyplane controls resulting in better light, air and aesthetics along Freelon. The proposed design therefore leverages Skyplane to create a lively and dynamic form, which varies from every view, and creates a variety of floorplate sizes and shapes, with many roof terraces distributed among many different levels. The plan applies Skyplane controls above an 85-foot podium. However, our design goes a step further by extending the dynamic massing down to the street level, to break down the scale of the long street-wall, while still doing its part to help define the street-room suggested in the plan. The intent is to apply varying façade treatments and textures to the different masses, to further accentuate the differentiation and expressiveness of the design. And as envisioned, the building’s covered arcade, which wraps around the development from Brannan to Freelon, would satisfy the Key Site’s public open space (“POPOS”) requirement. We’ll keep you posted and plugged-in. Another architectural disaster. The “massing more interesting from afar”? Really, the issue is at street level, up close and personal, and from that perspective this will be a massive squat building. The faux POPOS is ridiculous. The “arcade” is an excuse to allow the building to project above the sidewalk once you get several floors up. A hulking monster which will further degrade SOMA. The City night has well have no POPOS requirement as what it has is effectively a wink and nod to allow developers to maximize a buildings footprint and avoid providing any truly open/green space. As rendered above, the open arcade, and mass above, would actually be sidewalk adjacent. Yeah. A covered extra wide sidewalk. And a building that extends to the sidewalk/street line. The City allowing the developer to cover every inch of the lot and actually go beyond it and over the sidewalk. This building would degrade the street/sidewalk level experience. Other cities are greening/opening up the perimeters of their new buildings and building pocket parks and landscaped alleyways. 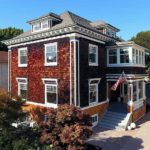 Not so San Francisco – the city that knows how. There no “sidewalk experience” there to degrade. And this whole post reads like “My subjective and unsubstantiated opinions of aesthetics are fact”, which to your credit, is very on-brand. Under an already small height limit……. I think this city thinks soo far backwards its actually pathetic. I dont even know what to say…. for a place that thinks it is so smart and innovative… WAKE Up.. its actually quite the opposite. Absolutely sad. that wrap-around arcade POPOS is a ridiculous non-starter. Go back to the drawing board. It isn’t a good space to hang out, but I would actually get to use that POPOS more than most of the rooftops that are closed after 5 and on weekends. Would prefer all of them to be open all the time like this. I agree, hmmm. Calling this a POPOS is a huge stretch. It’s a covered, extra-wide sidewalk. Sorry, but that shouldn’t cut it. I do like the overall design of the building though. They did a good job of breaking down a very large mass while allowing the overall look to hang together. Definitely pretty poor for a POPOS. OTOH, it’s miles better than those ‘in the sky’ POPOS. Those are the worst. Or maybe those ‘in the sky’ POPOS are the best. Where else in downtown frisco can you get access to free views like those at 343 Sansome, 150 California, 50 Post, 23 Geary, 825 Market….. I dunno, I’m not offended by it. As rendered, the super clear glass provides some sense of connection between the street and the interior activities, which is civic minded. If they have retail/services that encourage people to linger in the arcade area (a big if), it could be a nice addition to the neighborhood. They could also use a less transparent glass and occupy the ground floor with an unnecessarily large lobby + unrentable retail units, in which case I’d agree with all the haters above. While I do like sidewalk setbacks – especially shaved corners, I’m not a fan of columns on the outside. I’d much rather see the front floor setback 6 feet and columns enclosed behind glass in the lobby or whatever is on the ground floor. Also, did they really talk about “limiting size” in the same paragraph as important proximity to Muni station? this is just another ugly building design in what should be a high density, modern looking area. offices are going to pay exorbitant fees to lease this space yet its being designed like some boilerplate crap that most cities would never allow. making trips to london, new york, and even cities like portland and seattle is just depressing seeing how much better their modern architecture is. agree here. this should be at lesat 400 ft.
by the way, i dont like outside POPOS because our herin and homeless problem is jus too overwhelming and they will take over in this location. Something tells me that at a height of 160 feet this project will require a shadow study of the winter sun set on South Park. Pay attention to this ruling by the BOS as it relates to shadows on parks owned and operated by Rec & Park. Mmm, that covered sidewalk masquerading as public open space? I’m not buying it. Also, on the Brannan Street side – where *is* the sidewalk? It is unclear what is happening there; looks like the building goes right up to the street. I’m down with the building overall though. Challenging the covering of the sidewalk like that feels like a reasonable, well, challenge to this proposal.